Marinate them with some salt and pepper for about 15 minutes. Heat the pan with some olive oil and pan-fry the prawns until they are done. Mix the baked beans with the seasonings of 2 tablespoon mayonnaise and 1/2 tablespoon of lemon juice. Comments: This recipe is loaded with potent antioxidants, Vitamin C & Selenium that plays a vital role against cancer & heart disease prevention. Enjoy the benefits of high fiber from the baked beans added in the recipe that is associated with fewer digestive complaints, better blood-sugar control, lower blood-cholesterol levels and reduced rates of colon cancer, heart and kidney disease. 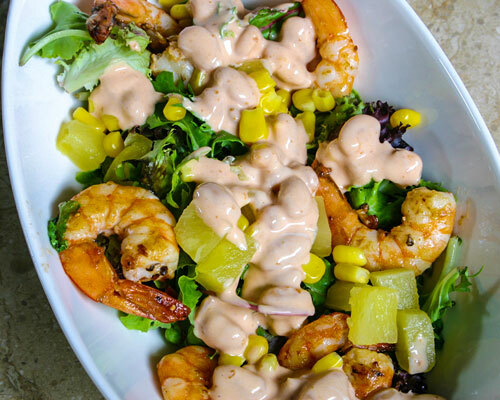 One serve of this recipe yields about 19% daily value of the saturated fat that is derived from mayonnaise & prawns added in the recipe and this can be reduced by choosing low fat/non fat version of mayonnaise or reducing the amount of mayonnaise added in the recipe.